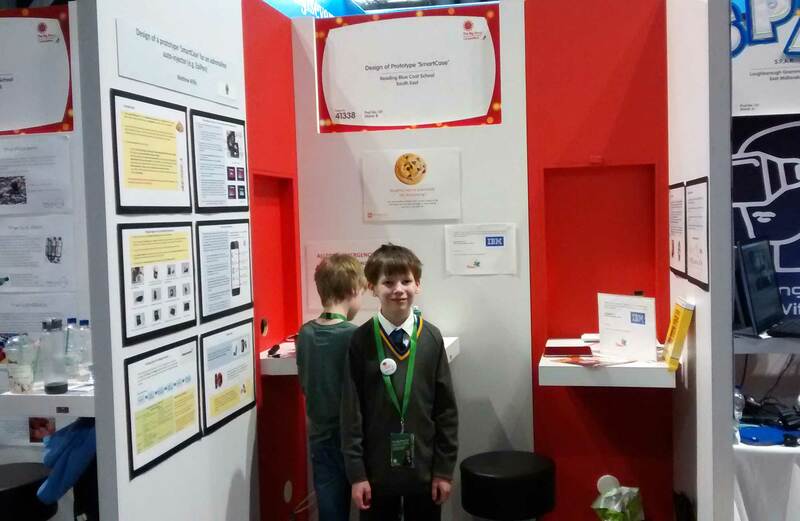 Year 7 scientist Matthew – who won the Junior Engineering prize in the Big Bang UK Young Scientist and Engineers Competition 2017/18, as well as Blue Coat’s Junior Rosebowl competition last term, with his prototype of a smartcase for an adrenaline auto-injector such as an epipen – did really well in the finals of the UK Young Scientist and Engineer of the Year competition at the Big Bang Fair in Birmingham in early March. On the first day of setting up, Matthew was interviewed for Youtube by ‘Blue Peter’ scientist, Greg Foot. Around 500 finalists from around the country presented their projects and, after the first day of judging, Matthew’s project was selected to be judged for the Thales Award for innovation – and, on the following day, for the Network Rail engineering prize. Although he didn’t win, Matthew did really well and was presented with a finalist’s medal at the award ceremony. According to his mother, Matthew had a great time and he enjoyed sharing his passion with other schoolchildren, who frequently visited his stand. He would like to enter a new project into the regional competition later on this year.